You know that time of the year when you need to clear out your closet so you can make room? Yep, I’m sure all of you NYC peeps know exactly what I’m taking about…. So while I was doing my yearly summer to fall closet switch, I stumbled upon this jean dress I’ve had from Forever21 for at least 4 years. I think the last time I wore it was for my friend’s backyard bridal shower and I totally forgot I owned one. I was this close to getting rid of it, but I know when certain fashion trends make a come back, I always regret giving away items I think might resurface. So as I realized this dress might come in handy one day, I figured I could put together a few looks and If I ended up liking them, I would decide to keep the dress. 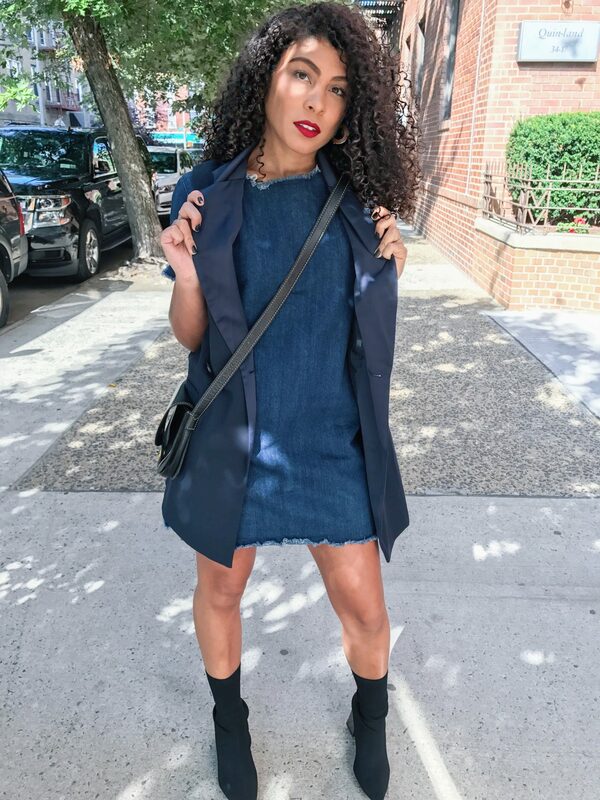 Believe it or not, this little jean dress actually works wonders and can be styled in different ways, and because my work attire is business casual, I really miss wearing denim during the week. For this effortless workwear ensemble, I added a white button up, but you can add any blouse (or color) to wear under the dress to achieve the same look. You could also opt for a more edgy look if wearing a jean dress to work isn’t your style. I added a sleeveless blazer with sock booties to complete it. For the last look (but room for plenty more), I paired the dress with a leather mini skirt so that it actually looks like a top. I really want to get use out of all of my dresses, so I’ve been doing this thing lately where I either wear them over pants or throw a sweater over them, which you’ll see more of me in soon! Adding a skirt to a dress was something I’ve never tried before, but I’ll definitely be trying it again!